Did you know that fall is considered the best time to seed your lawn? By the time fall comes rolling around, we are pretty tired of cutting our lawns and are often looking at spending the last few nice days enjoying the weather, rather than working in our yards. However, a little work now, can help ensure you have a thicker more beautiful lawn next spring. Fall provides frequent rainfall, warm soil temperatures, and cooler air temperatures. All of this promotes a warm, yet moist environment for grass seed to germinate and take hold. By the time next summer rolls around, our new seedlings will be will established and able to withstand any weed preventers, weed killers, and drought-like conditions we are likely to experience. Scotts recommends that seeding be started by Sept 15th this fall. Even though, this is not a hard deadline, the sooner you start, the better chances you have at the lawn coming in and becoming well established before the winter. Don’t worry though, those seeds that don’t germinate this fall will sprout next spring. Not all grass seeds are self-repairing, so it is important to seed bare spots and to overseed thin lawn to ultimately crowd out weeds and promote a thicker lawn. Here’s a 5 step process to ensure you optimize the potential for optimal grass germination. Rake up the dead grass: Use a hand cultivator or small trowel to pull up the dead grass. NOTE: Sometimes grass will just go dormant over the summer and then spring back once it gets enough water. 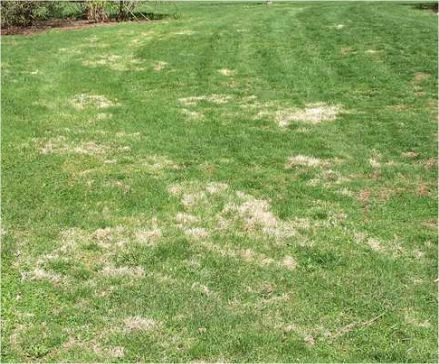 If your brown patch has some green grass and it is still rooted in the ground, let these spots go a couple of weeks and see if they spring back with a little cooler weather and some rain. If the spots pull up with no, or little resistance they are most likely not coming back. These areas need to be re-seeded. Rough up the soil/add top soil: A good fertile base is critical to getting your grass to germinate. Rough up your soil with a hand cultivator. For a more ideal planting medium add approximately 1/4″ – 1/2″ of top soil (Garden Magic or Scott’s Seeding Soil) to the ground. Select the proper seed: I could expand on this section a lot more, but we’ll keep it simple to keep the entry short. Basically, you want to select a seed mixture that is conducive to the amount of light the bare spots get in your lawn (shade, sun/shade, sunny, etc.). For more information on selecting the right seed, see one of our specialists in our Lawn & Garden department to ensure you get the right bag for your needs. Sprinkle Seed: Seed should be spread down at a rate close to the density you would sprinkle a cookie with sprinkles. Lightly dust/cover with Sphagnum Peat Moss: A light dusting of peat moss will help add some additional moisture retention to the soil. It is critical that grass seed gets ample moisture before and especially after the seed germinates. The sphagnum Peat Moss will give it that little extra boost, especially if you don’t add fresh topsoil before laying your seed down. Don’t put down too much peat moss (over 1/4″) as that will reduce the chance it will receive ample sunlight necessary to germinate. Replanting grass seed in the fall will not only help to keep your lawn looking good and dark green, but it will prevent weeds from taking over these dead spots next spring. For a thicker, healthier lawn, don’t procrastinate and start this fall!